Telangana to fill vacant posts in NIMS Of the total posts, 150 are staff nurse, 41 senior residents, 28 assistant professors, 15 associate professors and 14 professors among other posts. The State government has accorded permission for filling up 399 vacant posts in the Nizam’s Institute of Medical Sciences (NIMS). The direct recruitment of the vacant posts will be done through the departmental selection committee and accordingly the necessary orders were issued on Wednesday. Of the total posts, 150 are staff nurse, 41 senior residents, 28 assistant professors, 15 associate professors and 14 professors among other posts. 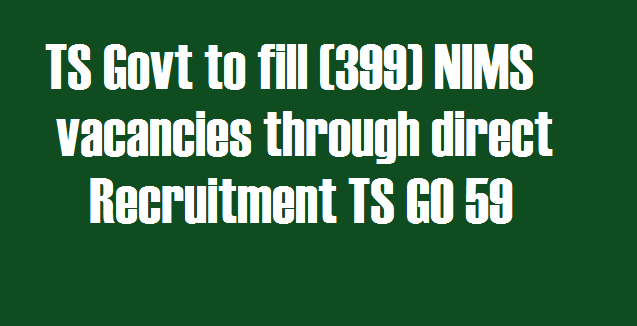 Public Services – HM&FW Department - Recruitment – Filling up of Three Hundred and Ninety Nine (399) vacant posts in Nizam’s Institute of Medical Sciences (NIMS) through the Departmental Selection Committee – Orders – Issued. 1. G.O.Ms.No.176 Finance (HRM-II) Department, Dt:28-11-2017. 2. HM&FW Department, U.O.No.5166/A2/2016, dt.7.05.2018. The HM&FW Department and the Director of NIMS, Hyderabad, shall take necessary action for filling the respective posts duly following the Rule of Reservation, the provisions of the Presidential Order and the provisions of the Service Rules applicable to the relevant posts. They shall adopt a transparent selection procedure for the purpose. The department shall obtain specific orders on the composition of the selection committee, selection process and other issues related to the recruitment process as per the statutory provisions applicable duly following the rules of business. 3. The HM&FW Department and the Director of NIMS, Hyderabad shall furnish details of all vacant posts authorized in this order, including the local cadre wise vacancy position, roster points and qualifications, etc., to the recruiting agency immediately under intimation to Finance Department. The Department shall issue necessary amendments to their service rules / Government Orders as regards recruitment procedure / recruiting agency, wherever necessary, before issue of notification.